Austin, TX – Austin’s well-known Feng Shui expert, Stacy Davenport, can now be found online at www.StacyDavenport.com. 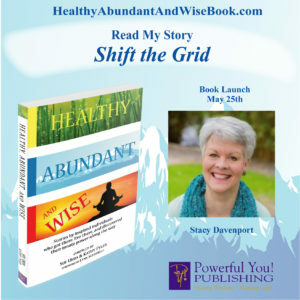 Her wisdom as an energy catalyst can be found in the new book Healthy, Abundant and Wise releasing May 25, which includes stories by inspired individuals who got there, live there and discovered their innate power along the way. Purchases made on May 25th include many bonus gifts. Davenport is an experienced, dynamic and insightful certified Feng Shui expert, development Coach, Akashic Records Consultant, life-purpose Hand Analyst, educator and author. Her engagement is an energy catalyst for others. Strongly committed to the art of personal and professional transformation, she has spent more than two decades coaching individuals and business leaders on how to create positive change within their lives and their businesses. In Austin she has been featured on KEYE TV news, Good Life magazine and the Austin American-Statesman. Feng Shui is the ancient Chinese art of improving every aspect of one’s life by enhancing one’s environment according to the principles of harmony and energy flow. Davenport has worked with over 3,000 individuals from around the world and their spaces through Feng Shui consultations and space and energy clearings. Davenport uses Feng Shui principles and space clearing processes to encourage energy flow in both homes and businesses. For example, in all five locations of milk + honey spa, she strategically placed red envelopes filled with rice and spices, and placed crystals in the walls during construction to set intentions. “When you make an effort to keep the energy around you and within your home and business clear and flowing, you pave the way for all sorts of great opportunities and success,” says Alissa Bayer, the owner of milk + honey spa. Bayer raves about results from working with Davenport. Prior occupants and events in any space leave an energetic imprint in this grid that creates positive or negative influences on the environment and all its current occupants. This energy grid holds stuck, stagnant, and negative energetic imprints and their influences. Davenport uses a powerful and life enhancing process called Energy Grid Recalibration. During this process the detrimental energy pockets and their influences upon personal and professional environments are neutralized, cleared and re-calibrated. The end result is an environment that is balanced to a higher level of dynamic coherence which supports harmony and good fortune thus enhancing one’s personal, professional, financial, emotional and spiritual life. Shift Your Energy and Transform Your Life! Change is Good: The Energy and Essence of You. JOIN THE STACY DAVENPORT EMAIL LIST!